CanSkate, Skate Canada's, learn to skate program, is one of the most sought after skating programs in the world. CanSkate was developed by experts to teach the fundamentals of skating in a progressive and sequential manner. Designed for beginners of all ages, the focus is on fun, participation and basic skill development.Participants earn ribbons and badges as skills are mastered.Skaters are taught in a group lesson format by a National Coaching Certification Program (NCCP) certified professional coach, assisted by trained program assistants. Standards have been nationally developed and tested for success by experts and are a part of our CanSkate program. On-ice activities require 90% movement – skaters are moving and learning using circuits and stations to practice skills; use teaching aids and music; use activities and games according to age groups and award CanSkate badges as skills are mastered. KidSkate - This Pre-CanSkate program, is intended for skaters 3 or 4 years of age that have never skated before or have little skating experience. This fun program is taught in a group setting and includes games and activities that are geared towards teaching your kids how to to be comfortable on skates. JumpStart (Intro to Figure Skating!) - JumpStart is a transition between basic skating skills and figure skating techniques. This level is tought in a group setting and participants are REQUIRED to have figure skates and CSA approved helmet to participate. BALANCE: Concentrating on most forward skills, pushing technique and edges. CONTROL: Concentrating on most backwards skills, stopping and speed elements. These are the ABC's of the CanSkate Program. 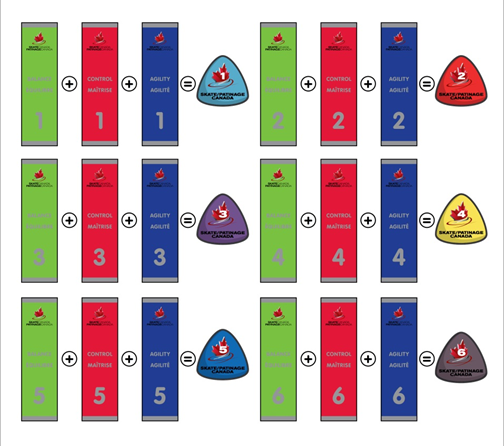 To receive a stage badge, skaters must achieve all Fundamental Area ribbons (Balance, Control and Agility) from the corresponding stage. The skill requirements for each Fundamental are indicated on the report card.